We offer trekking, hacking and tuition on trustworthy native ponies from experienced and qualified staff. Most of our ponies are Highlands and Fells - sure footed and safe ponies who instil confidence in their rider. 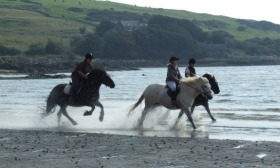 Brighouse Bay Trekking is approved by the TRSS (Trekking and Riding Society in Scotland) and is annually inspected to meet their high standards.